The motherchip talks ieee 1284 protocol with the EPP parallel port, receiving control commands, motor torque commands, and receiving position, state, home offset, and general i/o. 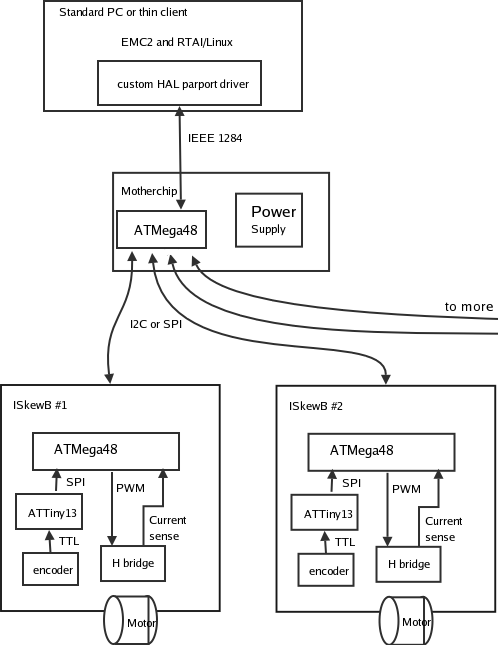 The ieee 1284 protocol has some rather tight timing requirements (must pull ack low within 10usec of data strobe) so the ATMega48 will interrupt on the DATA signal of the parport, and ignore other comms during this period. Another ATMega48 in each iskewb handles comms, i/o, and PWM's the motor, while the attiny13's in the are busy doing nothing but counting encoders. The motherchip has 8 (or more?) slave select lines (or i2c ports) to talk to 8 iskewb's or other peripherals. Maybe I will throw in some kind of power supply monitoring as well..
Should be able to squeeze it into a tiny card, but will fit into half a 1U rack slot if nothing else..
to protect the computer and parallel port from voltage surges and protect the motherchip from static discharge during handling - cheap insurance, Jameco P/N 320725 $1.29 each min qty 1 -- might be too slow, rise time 5us fall time 3us. HCPL2530 2 channel high speed opto .4us rise time .4-1.5us propagation delay Digi-Key $1.94 ea. tlp2630 2 channel high speed opto 0.03us rise time 0.075us propagation delay, note: inverts the output digi-key $2.25 ea. ES1607 shielded PCB mount RJ45 jack from excesssolutions.com $0.25 each min qty ?? Based on "PukiWiki" 1.3 by yu-ji. Powered by PHP 5.3.2-1ubuntu4.5. HTML convert time: 0.083 sec.